The most classic item in a wardrobe – the t-shirt – can always do with a bit of a spruce up. Don’t get me wrong, I love a simple tee with cut-off denim shorts combo, but that does get a little boring. American Apparel do a great range of t-shirts that look good without needing anything in an amazing array of colours, but it’s still just lacking that individual identity. Before we start, and I’m sure most of you will agree with me on this one, I really hate ‘girl-fit’ t-shirts – why do they make them so rubbish compared to boys? The material suddenly goes all thin and stretchy and they just never look good, there’s just no point even wasting your time trying to rework one of them. For me it’s all about the regular ‘boy-fit’ tees, vintage boys t-shirts in fact. Put me in a pile of ’90s musky t-shirts and I’m a happy girl. With these, it’s often a case of just rolling up the sleeves but sometimes you might find one in the perfect fabric and colour but it’s just TOO big so you need to turn it into a super cute creation of your own. I found this tie dye tropical print t-shirt in my friend’s wardrobe. He (luckily) couldn’t see its enormous Ibiza style potential, and to be honest, its not the most masculine of colour schemes and print (why on earth did he have this in the first place?!) so I took it off his hands! I turned it inside out, lay it flat on the floor and just used another top in my wardrobe as a template – it’s that easy! Cut around it allowing for hems where you’re going to sew, then pin those edges together and get on the sewing machine. Don’t even worry about the edges being too perfect, it’s part of the charm dahhhling! If you’re not going to hem the edges, an amazing tip for making them look not too freshly cut is to just give the fabric a little tug either end of the edging and then it just curls over nicely! For summertime vibes I went with the cropped t-shirt look… how short you take it is totally up to you – I like it so it shows just a tiny bit of midriff when you wear it with something high waisted, it’s the classiest way to do cropped. Obviously this really is a look that can be worn anywhere – that’s what is so versatile about a tee, it just depends how you wear it. 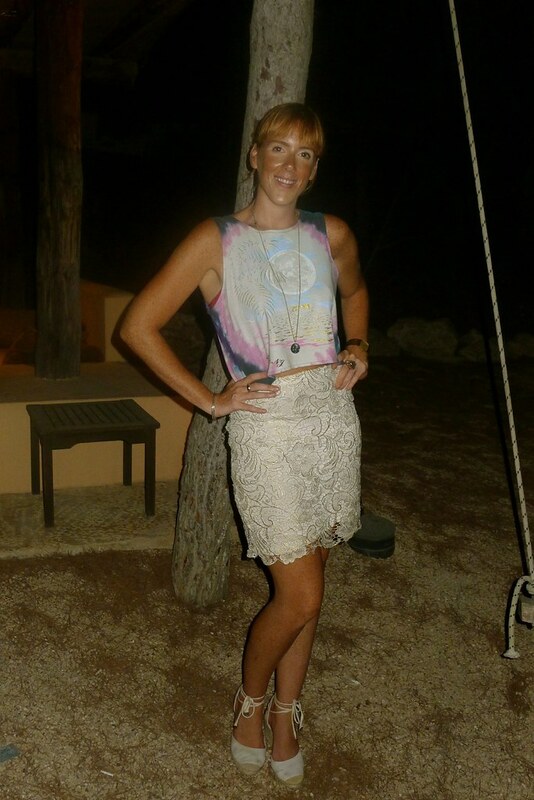 But for me it was the perfect thing to put on with my Mango cream and gold lace skirt and trusty Ibiza espadrilles. For jewellery I kept it simple with a necklace featuring an Indian rupee coin that never seemed to leave my purse when I was living in Mumbai for a few months last year and where better to wear it than to a special VIVa Warriors* BBQ at DJ Steve Lawler‘s villa hosted by Steve and his lovely wife Daniela. VIVa Warriors takes place every Wednesday at Sankeys Ibiza. White Ibiza readers get special discounted entry of 15€ before 2am. Please email lee@sankeys.info with ‘White Ibiza VIVa Warriors entrance’ in the subject line to confirm your names. 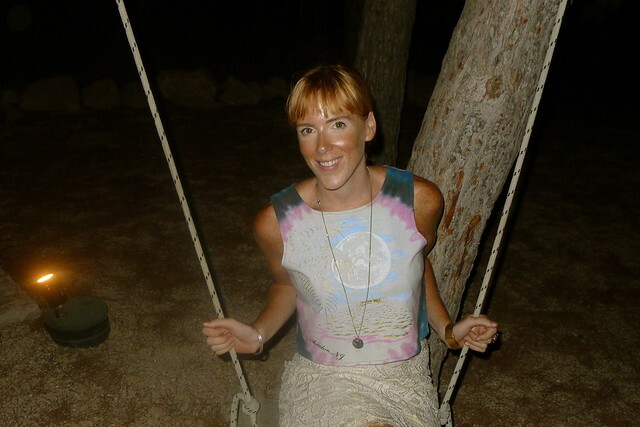 Bex Pawsey is the creator of the ever-growing beccaboo reworked range – customised items created with unwanted goodies found here on the white isle. For more info on sales and commissions, email bex.pawsey@me.com.